Carolina Nitsch Project Room is pleased to present IN DIRECTION, a new installation by Richard Dupont and the first exhibition of the artist at the gallery. The installation consists of three large figures cast in polyurethane surrounded by mirrored panels which transform the exhibition space into a quasi-virtual, interactive environment. Presented in the storefront Project Room, the installation suggests a staged experience, albeit an inverted one, with the activity of the street outside brought inside, and the room itself expanded into a four dimensional spatial riddle. 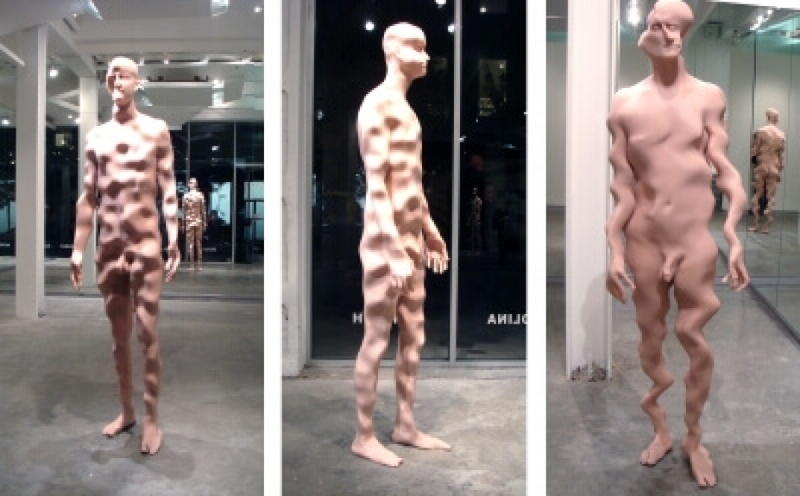 Standing just over life size, the three figures appear to be liquefying when seen from certain angles or camouflaged from others. Like a number of Dupont’s installations since 2005, they are based on a three dimensional digital scan of the artist’s body. Before being molded and cast in resin, the body model has been distorted using visual computer effects. 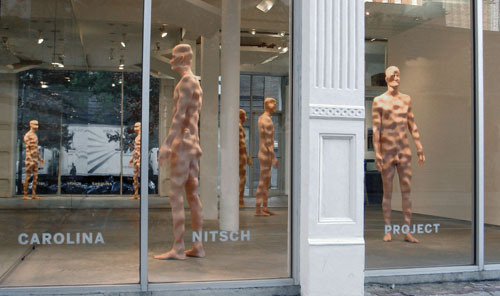 Once translated into three dimensional sculptures, the figures appear to be shifting shape as the viewer moves around them. These fluctuating appearances are further enhanced by the mirrored environment which presents everything from four perspectives simultaneously – including the viewer and the activity on the street. The phenomenon of reflected forms that do not merge with the actual form questions the reality of mirror reflection, symmetry and directionality, and more broadly, perception itself. This situation creates a type of cognitive dissonance which draws parallels to our increasingly artificial visual world. Richard Dupont recently presented a major installation, “Terminal Stage”, at The Lever House in New York City, which is the subject of a new monograph just published by Charta. Through December 21st Dupont has a solo museum exhibition, “Between Stations”, at the Hudson Valley Center for Contemporary Art (HVCCA). His work is in numerous collections including The Museum of Modern Art and The Whitney Museum of American Art. Born in 1968, the artist lives and works in New York City.